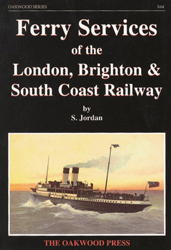 From a small contractor’s wharf at Shoreham Harbour the ferry services of the London, Brighton & South Coast Railway (LBSCR) grew to become the fourth largest railway-owned passenger ferry service in the United Kingdom. Following early legal setbacks the LBSCR quickly set up a thriving cross-channel service in partnership with the Western Railway of France, and later, with the London & South Western Railway, Portsmouth-Isle of Wight ferries. In the 83 years the LBSCR was in existence it chartered, shared or owned over 125 different vessels, ranging in size from the largest cross-channel passenger ships to tiny pinnaces for passing messages in Newhaven Harbour. Some, the passenger vessels, were the height of luxury, whilst a few, the non-revenue earning coal hulks, were rotten and barely afloat. In their various guises the company’s vessels carried over seven million passengers and 1.5 million tons of cargo on the Newhaven-Dieppe route alone. During the First World War 10 million allied troops and 11 million tons of war stores passed through the company’s port at Newhaven.